This delicious protein powder now available in natural vanilla is an excellent supplement for elimination diets. With all essential vitamins and minerals, Metabolic Detox Complete helps meet nutritional needs during detoxification. 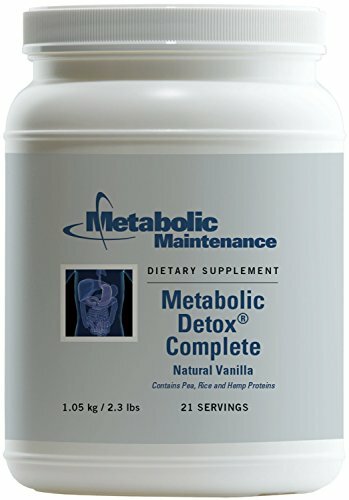 Metabolic Maintenance is excited to announce that our Metabolic Detox Complete powder contains no stevia. SUPPORT DETOXIFICATION DIETS - With all essential vitamins and minerals, Metabolic Detox Complete helps meet nutritional needs during detoxification and elimination diets. BIOAVAILABLE BOTANICALS AND ANTIOXIDANTS - Contains the classic liver botanical Silymarin (from milk thistle seed extract) with antioxidants NAC and ALA. CONVENIENT, SENSITIVITY-FRIENDLY - Great tasting and easy to mix in water of your beverage of choice. Sweetened with monk fruit extract. Contains no Dairy, Soy, Gluten, Egg, Soy protein, corn protein, nuts, and artificial sweeteners. PURITY, QUALITY, POTENCY - No fillers, binders, preservatives, artificial colors or flavors. Vegetarian capsules. No gluten, egg, peanuts, tree nuts, or magnesium stearate. Supplements arrive in BPA-Free, recycled amber bottles that protect from light contamination. PHYSICIAN'S CHOICE - The health care professional's choice for high-quality supplements since 1984. We base our products on the latest wellness research and clinical studies. Products you can trust, at an exceptional value.